Shooting sports are extremely popular with Scouts of all ages. Although one of the safest sports that Scouts can enjoy, it can be dangerous. It is the Council’s goal to provide exposure to the shooting sports in a safe, fun and educational way. Our goal is to develop marksmanship skills and safe gun handling practices in a safe, controlled environment. Camp Sequassen has a Rifle Range and a Shotgun Range which are available for use on Saturdays only, September through May. Hoyt has a Rifle Range which may be used on Saturdays and Sundays year round. Access to the camp ranges and firearms is a privilege extended to qualified adult leaders to support the BSA programs. It is assumed that anyone permitted to operate a Council range will follow NRA/BSA procedures and give special care to the program resources (guns, trap, etc.). Anyone failing to meet these expectations will lose their privilege of operating the ranges. Ranges must be reserved in advance through the Camp Registrar, Carolyn Cruson, by calling 203-951-0237. A Range Reservation Form must be filled out and filed at the Council Resource Center before a range may be reserved or opened. The reservation form must identify at least one Range Instructor who has current instructor certification from either the National Rifle Association or a BSA National Camp School. The NRA/BSA certification must specifically cite qualification for the type of shooting planned, e.g. rifle or shotgun, with a future expiration date. The Range Instructor must have a copy of his/her certification on file at the Scout Resource Center and be present on the range while it is in operation. The reservation must also identify a Range Safety Officer, whose current NRA RSO certification is on file at the Scout Resource Center. There must be an RSO present on each range, if multiple ranges are in operation simultaneously. The Range Instructor(s) and the RSO(s) may not be the same person. For Camp Sequassen Range use, at least one of the certified adults must have completed the Camp Sequassen Range Instructor Orientation. The range must be operated according to the NRA/BSA shooting sports standards. The registrar will provide a copy of the standards upon request. It is each Range Instructor’s responsibility to ensure the standards are met. A Certified NRA Instructor and a RSO must be present on each range the entire time it is open. The ratio of instructors to shooters shall be 1 to 1 for shotgun and 1 to 8 for .22 caliber rifle. All ranges will operate between the hours of 9:00 AM – 12:00 noon and 1:00 PM – 4:00 PM, only. The Range Instructor(s) will have either cell phone or radio communications with the Ranger or Campmaster. The radio or cell phone must be tested for reception before opening the range. Also, the red range flag must be raised when the range is in use and a First Aid kit, supplied by the unit, must be present. Access to the keys for the Arms Room will be provided by the Ranger or Campmaster. Gun selection is to be made according to the unit’s needs, availability of certified instructors and the type of certification the instructor has i.e., rifle and/or shotgun. Privately owned guns will not be used at either range unless specifically approved in advance by the Camp Ranger. 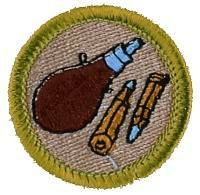 Scouts may only shoot .22 caliber rifles and 12 gauge shotguns on the ranges. NO EXCEPTIONS. Guns must be cleaned and returned in person to the arms storage room. Cleaning supplies are available in the arms room or available from the Campmaster or Ranger. There is a $25 cleaning fee for guns returned un-cleaned. All trash/spent shells shall be removed by the unit. Guns will not be “left” or unattended at any time. At the end of the day, the Range Instructor will fill out the daily log with any pertinent information i.e. gun malfunctions, shortage of resources, etc. The log sheet is to be left in the log book. A tag must be attached to any gun needing service. Tags are available in the Arms Room. Always check the range bulletin board inside the Arms Room for up-to-date information or guidance. All protective equipment and shooting aids such as benches, stools, gun blocks, posters, etc., must be secured and stored neatly. Eye protection must be inserted into protective socks and eye and hearing protection are to be stored in sealed, mouse proof totes. Use of trap or rifle range: $100 per day. If a unit reserves and operates both ranges simultaneously at Sequassen, the fee is $175 per day for both. Fee includes guns appropriate for the range and size of group. Clays: White Flyer biodegradable targets are REQUIRED to ensure proper functioning of the trap machine.